During the last decade of the nineteenth century Claude Debussy was a frequent visitor at the gatherings of writers and artists held on Tuesday evenings at the home of the poet Stéphane Mallarmé. In 1876 Mallarmé had published a poem called ‘L’après-midi d’un faune’ and sixteen years later Debussy, realizing that Mallarmé had been hoping for some kind of theatrical Presentation of his poem, began composing a work described at that stage as ‘Prélude, Interludes et Paraphrase finale’, presumably with the intention of providing some incidental music for such a performance. In the event it was just the Prélude à l’après-midi d’un faune that materialized but, nonetheless, Mallarmé expressed himself pleased with the way that Debussy’s music brought out the emotion of his poem. It was given its first performance in Paris on 22 December 1894. The conductor on that occasion, Gustave Doret, describes in his memoirs how Debussy had come to his apartment with the proofs of the orchestral score of the piece and had played it through several times on the piano. Doret was amazed at the composer’s ability to reproduce at the keyboard all the orchestral colours and the nuances of the individual instruments, thus creating an apparently perfect interpretation of the work. Maurice Ravel, who once proclaimed that he would like the Prélude à l’après-midi d’un faune to be played at his funeral, transcribed it for piano duet in 1910, but the arrangement (recorded here) for two pianos is by Debussy himself and dates from 1895. In September 1894 Debussy wrote to the Belgian violinist Eugène Ysaÿe about three nocturnes for solo violin and orchestra that he was composing for him. (Ysaÿe’s quartet had given the first performance of Debussy’s String Quartet the previous year.) In the first of these pieces the orchestra was to consist of strings alone, in the second of flutes, horns, trumpets and harps, while in the third all of these instruments would come together. Debussy told Ysaÿe how he wanted to experiment with the different combinations possible with a single colour in the same way that a painter might make a study in grey. Two years later Debussy referred to these nocturnes again, implying that they had been completed, and still hoping that Ysaÿe would be the one to play them. Although this was not to be—for, by the time the Trois Nocturnes came to performance, there was no part for solo violin—he was able to tell Debussy in 1903 that he had decided to conduct them. It is not possible now to determine how closely the final version of the Nocturnes resembles either the piece Debussy was writing for Ysaÿe or yet an even earlier work, the Trois scènes au crépuscule, that some consider to have been its true precursor. The first performance of the Nocturnes was planned for 9 December 1900, but in the event only the first two movements were played because the female chorus required for ‘Sirènes’ was not available. It was not until 27 October 1901 that the work was heard complete for the first time. At about this time, Ravel, in collaboration with Debussy’s stepson and pupil Raoul Bardac, began work on a transcription of the Nocturnes for two pianos. This was not given its first performance, however, until 24 April 1911 when Ravel and Louis Aubert played it at the Salle Gaveau in Paris. In January 1907 Falla wrote to Debussy asking for advice prior to a performance he was about to give in Madrid of the Danse sacrée et danse profane. In his reply Debussy was not prepared to go into much detail. He referred to the ‘colour’ of the two dances, comparing the ‘gravity’ of the one with the ‘grace’ of the other and expressed himself content to leave the performance to the Spaniard’s own musical taste. Falla was going to play the Danses on the piano, but they had originally been composed for the harp. In 1894 Gustave Lyon had invented a chromatic harp which, by virtue of an extra set of strings, removed the need for the pedals found on the conventional instrument. The Paris firm of Pleyel, with the intention of popularizing it, commissioned Debussy, amongst others, to compose something for the chromatic harp. The two Danses, for harp and string orchestra, were composed in 1904 and were dedicated to the instrument’s inventor. It would seem that Debussy (or perhaps his publishers) had little faith in this new invention, for the score indicates that the solo part in these dances can also be played on the pedal harp (as they usually are) or on the piano. The reduction for two pianos, which also dates from 1904, was made by Debussy himself. The outbreak of the First World War in August 1914 greatly affected Debussy, rendering him almost silent as a composer. To keep his mind occupied, his friend and publisher Jacques Durand had persuaded him to take part in the creation of a new French edition of the Standard classical works to replace the existing German one. 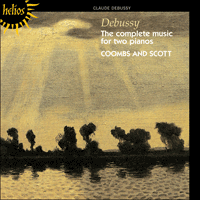 Debussy expressed an interest in this project, pointing out that he saw a particular need to produce new versions of the piano-duet arrangements of all the symphonies in the catalogue. (He had played many of these as a young man while employed at the home of Tchaikovsky’s benefactress Nadezhda von Meck.) The main task that he chose to complete, however, was the editing of Chopin’s piano music. By June 1915 he was beginning to think again of composition and told Durand of some pieces for two pianos he had in mind. He spent the summer of 1915 with his wife at Mon Coin, a house in Pourville, near Dieppe, owned by the playwright Ferdinand Hérold whom Debussy had met at Mallarmé’s soirées, and while he was there he worked at his three Caprices en blanc et noir. By the time the composer and Jean Roger-Ducasse gave them their first performance in 1916 the title had been shortened to En blanc et noir. Each of these pieces, which according to Debussy were like the greys of Velazquez, is headed by a quotation. That for the first piece consists of a short extract from the libretto by Jules Barbier and Michel Carré that Gounod had used for his opera Roméo et Juliette. Some commentators have suggested that by quoting these lines—‘Qui reste à sa place / Et ne danse pas / De quelque disgrâce / Fait l’aveu tout bas’—Debussy was referring to those who, like himself, were not able to fight in the War. This does not, however, explain the dedication ‘à mon ami A Kussewitsky’. In 1913 Serge Alexandrovich Koussevitzky had invited Debussy to conduct several of his works, including the Nocturnes and the Prélude a l’après-midi d’un faune in Moscow and St Petersburg. Although the letters to his family indicate that he did not enjoy being so far from home and that he was indeed feeling very miserable in Russia, Debussy was impressed both with Koussevitzky’s indomitable spirit and with his orchestra. The quotation associated with the second piece comes from the Ballade contre les ennemis de la France by François Villon: ‘Prince, porte soit des serfs Eolus / En la forest ou domme Glaucus, / Ou prive soit de paix et d’espérance / Car digne n’est de posséder vertus / Qui mal vouldroit au royaume de France.’ Debussy’s anger against the enemies of France was inspired in particular by the death in battle of a cousin of Jacques Durand who had also worked for the family publishing firm. The dedication ‘au Lieutenant Jacques Charlot tué à l'ennemi en 1915, le 3 mars’, pinpoints the moment of the young man’s death and leaves no doubt as to the cause of it. Ravel was later to make a similar gesture to the memory of Charlot by dedicating to him the ‘Prélude’ from Le Tombeau de Couperin. The line Debussy quoted at the head of the last of these pieces—‘Yver, vous n’este qu’un vilain’—comes from a poem that he had already set as the third of Trois Chansons de Charles d’Orléans for unaccompanied chorus. Correspondence between Debussy and Stravinsky (to whom this third piece is dedicated) during October 1915, apart from dealing with arrangements for a performance of the Nocturnes in Geneva, reveals the preoccupation of both composers with the War, and their fear that it would lead not only to the destruction of their nations but also of their art. En septembre 1894, Debussy écrivit une lettre au violoniste belge Eugène Ysaÿe au sujet des trois nocturnes pour violon solo et orchestre qu’il composait pour lui. (L’année précédente, le Quatuor d’Ysaÿe avait donné la première représentation du Quatuor pour cordes de Debussy.) Dans le premier de ces morceaux, l’orchestre consiste seulement en instruments à cordes, dans le deuxième il comporte des flûtes, cors, trompettes et harpes, et dans le troisième tous ces instruments sont réunis. Debussy expliquait à Ysaÿe son désir d’expérimenter les différentes combinaisons possibles d’une couleur unique, de la même façon qu’un peintre pouvait faire une étude en gris. Deux ans plus tard, Debussy fit encore allusion à ces nocturnes, laissant supposer qu’elles étaient finies, et espérait encore qu’Ysaÿe en serait l’interprète. Ce souhait ne devait pas se réaliser—car lorsque les Trois Nocturnes furent représentés, il n’y avait pas de partie pour un violon solo—mais Ysaÿe put assurer Debussy en 1903 qu’il avait décidé d’en diriger la représentation. Il nous est impossible aujourd’hui de savoir combien la version finale des Nocturnes ressemble soit à l’ouvrage que Debussy écrivait pour Ysaÿe ou même à un ouvrage antérieur, les Trois scènes au crépuscule, que certains pensent avoir été son véritable précurseur. La première des Nocturnes devait avoir lieu le 9 décembre 1900, mais en fait, les deux premiers mouvements seulement furent joués, car le chœur féminin nécessaire pour les «Sirènes» n’était pas disponible. Ce n’est que le 27 octobre 1901 que l’ouvrage fut joué en entier pour la première fois. C’est à peu près à cette époque-là que Ravel, en collaboration avec Debussy et son beau-fils et élève Raoul Bardac, commença une transcription des Nocturnes pour deux pianos. Celle-ci ne fut joué pour la première fois que le 24 avril 1911 quand Ravel et Louis Aubert la jouèrent à la Salle Gaveau à Paris. En janvier 1907, Falla écrivit à Debussy pour lui demander ses conseils avant de donner une représentation de la Danse sacrée et danse profane à Madrid. Debussy répondit mais sans se lancer dans beaucoup de détails. Il faisait allusion à «la couleur» des deux danses, comparant «la gravité» de l’une avec «la grâce» de l’autre, et se disant satisfait d’en laisser l’exécution au sens musical de l’Espagnol. Falla allait jouer les Danses au piano, mais elles avaient été composées pour la harpe à l’origine. En 1894, Gustave Lyon avait inventé une harpe chromatique qui, grâce à une série supplémentaire de cordes, supprimait la nécessité des pédales qui se trouvent sur l’instrument conventionnel. Dans l’intention de rendre ce nouvel instrument populaire, la compagnie parisienne Pleyel avait demandé à Debussy, parmi d’autres compositeurs, de composer une pièce pour la harpe chromatique. Les deux Danses, pour harpe et orchestre à cordes, furent composées en 1904 et dédicacées à l’inventeur de l’instrument. Debussy (ou peut-être ses éditeurs) n’avait guère confiance dans cette nouvelle invention, puisque la partition indique que la partie solo de ces danses peut aussi être jouée sur la harpe à pédales (comme d’habitude) ou au piano. La réduction pour deux pianos qui date de 1904 est l’œuvre de Debussy lui-même. La déclaration de la première guerre mondiale, en août 1914, eut un très grand effet sur Debussy, et réduisit le compositeur presque au silence. Pour lui occuper l’esprit, son ami et éditeur Jacques Durand l’avait persuadé de participer à la nouvelle édition française des œuvres classiques pour remplacer l’édition allemande qui existait. Debussy sembla s’intéresser à ce projet, faisant remarquer qu’il voyait un besoin tout particulier à produire de nouvelles versions des arrangements pour duos de pianos pour toutes les symphonies figurant au catalogue. (Il avait joué de nombreux de ces duos, dans sa jeunesse, chez Nadezhda von Meck, la bienfaitrice de Tchaikovsky, où il était employé.) La tâche principale à laquelle il choisit de se consacrer, cependant, fut l’édition de la musique pour piano de Chopin. Vers le mois de juin 1915, il commençait à repenser à composer et parlait à Durand de quelques pièces pour deux pianos auxquelles il pensait. Il passa l’été de 1915, avec sa femme, à Mon Coin, une maison de Pourville, près de Dieppe, dont le propriétaire était Ferdinand Hérold. Debussy avait rencontré cet auteur dramatique dans les soirées de Mallarmé. Pendant ce séjour, il travailla à ces trois Caprices en blanc et noir. Quand le moment vint d'en donner la première en 1916, par le compositeur et Jean Roger-Ducasse, le titre était devenu En blanc et noir. Chacun de ces morceaux qui, selon Debussy, sont comme les gris de Velazquez, ont une citation en tête. Celle du premier morceau consiste en un court extrait du livret de Jules Barbier et Michel Carré utilisé par Gounod pour son Roméo et Juliette. Certains commentateurs ont suggéré qu’en citant ces vers—«Qui reste à sa place / Et ne danse pas / De quelque disgrâce / Fait l’aveu tout bas»— Debussy faisait allusion à ceux qui, comme lui, ne pouvaient prendre part au combat. Cela n’explique pas, cependant, la dédicace «à mon ami A Kussewitsky». En 1913, Serge Alexandrovich Koussevitsky avait invité Debussy à diriger plusieurs de ses œuvres, parmi lesquelles les Nocturnes et le Prélude à l’après-midi d’un faune, à Moscou et à Saint Petersbourg. Bien qu’il n’ait pas paru aimer être si loin de chez lui et qu’en fait il se soit senti très malheureux en Russie, si l’on en croit les lettres écrites à sa famille, Debussy avait été très impressionné à la fois par le courage indomptable de Koussevitsky et par son orchestre. La citation associée au second morceau—«Prince, porté soit des serfs Eolus / En la forest ou domme Glaucus, / Ou privé soit de paix et d’espérance / Car digne n’est de posséder vertus / Qui mal vouldroit au royaume de France»—vient de la Ballade contre les ennemis de la France de François Villon. La colère de Debussy contre les ennemis de la France était inspirée en particulier par la mort au combat d’un cousin de Jacques Durand qui avait aussi travaillé dans la compagnie d’édition familiale. La dédicace «au Lieutenant Jacques Chariot, tué à l'ennemi en 1915, le 3 mars» indique précisément le moment de la mort du jeune homme et ne laisse aucun doute quant à sa cause. Ravel devait plus tard faire un geste semblable envers la mémoire de Chariot en lui dédicaçant le «Prélude» du Tombeau de Couperin. Le vers cité par Debussy en tête du dernier de ces morceaux—«Yver, vous n’este qu’un vilain»—est tiré d’un poème qu’il avait déjà choisi comme le troisième des Trois Chansons de Charles d’Orléans pour chœur seul. La correspondance entre Debussy et Stravinsky (auquel ce troisième morceau est dédicacé) durant le mois d’octobre 1915, à part les discussions pour arranger une représentation des Nocturnes à Genève, révèle combien les deux compositeurs étaient préoccupés par la guerre, et leur peur qu’elle ne mène non seulement à la destruction de leurs pays mais aussi à celle de leur art. Im letzten Jahrzehnt des 19. Jahrhunderts war Claude Debussy häufig zu Gast bei den Zusammenkünften von Schriftstellern und Malern, die Dienstagabends im Hause des Dichters Stéphane Mallarmé stattfanden. 1876 hatte Mallarmé ein Gedicht mit dem Titel L’après-midi d’un faune veröffentlicht, und 16 Jahre später begann Debussy in der Erkenntnis, daß Mallarme die unbestimmte Hoffnung auf eine theatralische Umsetzung seines Gedichts hegte, ein Werk zu komponieren, das er in diesem Stadium als Prélude, Inter­ludes et Paraphrase finale bezeichnete, vermutlich in der Absicht, für eine der artige Aufführung die Bühnenmusik zu liefern. Am Ende wurde nur das Prélude à l’après-midi d’un faune verwirklicht, aber Mallarmé zeigte sich dennoch erfreut über die Art und Weise, wie Debussys Musik die Emotion seines Gedichts herausarbeitete. Das Werk wurde am 22. Dezember 1894 in Paris uraufgeführt. Der beteiligte Dirigent Gustave Doret schildert in seinen Memoiren, wie Debussy mit den Korrekturfahnen für die Orchesterpartitur des Stücks in seine Wohnung kam und es mehrmals auf dem Klavier durchspielte. Doret war verblüfft über die Fähigkeit des Komponisten, auf der Tastatur sämtliche Klangfarben des Orchesters und Nuancen der einzelnen Instrumente zu reproduzieren und somit eine augenscheinlich perfekte Interpretation des Werks zustandezubringen. Maurice Ravel, der einmal den Wunsch geäußert hatte, daß Prélude de l’après-midi d’un faune bei seinem Begräbnis gespielt werde, transkribierte das Werk 1910 für Klavierduett, doch das vorliegende Arrangement für zwei Klaviere stammt von Debussy selbst und entstand 1895. Im September 1894 schrieb Debussy in einem Brief an den belgischen Violinisten Eugene Ysaÿe von drei Nocturnes für Solovioline und Orchester, die er für ihn komponiere. (Ysaÿes Quartett hatte im Vorjahr Debussys Streichquartett uraufgeführt.) Im ersten dieser Stücke sollte das Orchester ausschließlich aus Streichern bestehen, im zweiten aus Flöten, Hörnern, Trompeten und Harfen, während im dritten all diese Instrumente zusammenfinden sollten. Debussy kündigte Ysaÿe an, daß er mit den verschiedenen Kombinationen experimentieren wolle, die sich mit einer einzelnen Klangfarbe erzielen ließen, genau wie ein Maler vielleicht eine Studie in Grau anfertige. Zwei Jahre später erwähnte Debussy die Nocturnes erneut, deutete an, daß sie vollendet seien, und brachte die Hoffnung zum Ausdruck, daß Ysaÿe sie doch noch spielen werde. Obwohl es dazu nicht kam—zum Zeitpunkt der Uraufführung der Trois Nocturnes enthielten sie keinen Part für Solovioline mehr—konnte Ysaÿe Debussy 1903 seinen Entschluß bekanntgeben, sie zu dirigieren. Es ist heute nicht mehr festzustellen, inwieweit die endgültige Version der Nocturnes dem Stück ähnelt, das Debussy für Ysaÿe schrieb, oder einer noch früheren Komposition, den Trois scènes au crépuscule, die einige für den wahren Vorläufer halten. Die Erstaufführung der Nocturnes war für den 9. Dezember 1900 vorgesehen, aber damals wurden nur die ersten beiden Sätze gespielt, da der Frauenchor, der für „Sirènes“ gebraucht wurde, nicht zur Verfügung stand. Erst am 27. Oktober 1901 war das Werk vollständig zu hören. Ungefähr um die gleiche Zeit begann Ravel in Zusammenarbeit mit Raoul Barda, Debussys Stiefsohn und Schüler, an einer Transkription der Nocturnes für zwei Klaviere zu arbeiten. Diese wurde jedoch erst am 24. April 1911 uraufgeführt, als Ravel und Louis Aubert sie im Salle Gaveau in Paris spielten. Im Januar 1907 schrieb Falla an Debussy und bat um seinen Rat bei der Vorbereitung einer Aufführung des Danse sacrée et danse profane in Madrid. In seiner Antwort zeigte sich Debussy nicht bereit, sehr ins Detail zu gehen. Er erwähnte die „Klangfarbe“ der beiden Tänze, verglich die „Gewichtigkeit“ des einen mit der „Grazie“ des anderen und erklärte sich ansonsten damit zufrieden, die Interpretation des Werks dem persönlichen Musikgeschmack des Spaniers zu überlassen: Falla wollte die Danses auf dem Klavier spielen, obwohl sie ursprünglich für Harfe komponiert worden waren. 1894 hatte Gustave Lyon eine chromatische Harfe erfunden, die dank eines zusätzlichen Satzes Saiten die Pedale unnötig machte, wie man sie beim konventionellen Instrument findet. Die Pariser Firma Pleyel hatte, um sie bekannt zu machen, unter anderem Debussy beauftragt, etwas für die chromatische Harfe zu schreiben. Die zwei Danses für Harfe und Streichorchester entstanden 1904 und waren dem Erfinder des Instruments gewidmet. Wie es scheint, setzte Debussy (oder möglicherweise sein Verlag) jedoch wenig Vertrauen in diese neue Erfindung, denn in der Partitur steht, daß der Solopart der Tänze auch auf der Pedalharfe gespielt werden kann (was inzwischen die Regel ist), oder auf dem Klavier. Die ebenfalls 1904 entstandene Bearbeitung für zwei Klaviere wurde von Debussy selbst vorgenommen. Der Ausbruch des Ersten Weltkriegs im August 1914 machte Debussy schwer zu schaffen und ließ ihn als Komponist fast ganz verstummen. Um ihn abzulenken, hatte sein Verleger Jacques Durand ihn überredet, an der Erstellung einer neuen französischen Ausgabe der klassischen Standardwerke mitzuarbeiten, die an die Stelle der existierenden deutschen treten sollte. Debussy äußerte sein Interesse an diesem Projekt und wies auf die seiner Meinung nach besondere Notwendigkeit hin, neue Versionen der Klavierduett-Arrangements sämtlicher Sinfonien des Katalogs herauszubringen. (Viele davon hatte er als junger Mann gespielt, während er im Hause von Tschaikowskis Gönnerin Nadezhda von Meck tätig war.) Die Hauptaufgabe, die er sich vornahm, war jedoch die Bearbeitung von Chopins Klaviermusik. Im Juni 1915 trug er sich erstmals wieder mit dem Gedanken an eine eigene Komposition und berichtete Durand von einigen Stücken für zwei Klaviere, die er im Sinn habe. Er verbrachte den Sommer 1915 zusammen mit seiner Frau in „Mon Coin“, einem Haus in Pourville bei Dieppe, das dem Dramatiker Ferdinand Herold gehörte. Debussy hatte Herold auf einer Soiree bei Mallarme kennengelernt, und während er sich in seinem Hause aufhielt, arbeitete er an den drei Caprices en blanc et noir. Als der Komponist selbst und Jean Roger-Ducasse 1916 die Uraufführung gaben, war der Titel gekürzt worden und lautete nun En blanc et noir Jedes der drei Stücke, die Debussy zufolge an die Grautöne von Velazquez erinnerten, ist mit einem Zitat überschrieben. Beim ersten handelt es sich um einen kurzen Auszug aus dem Libretto von Jules Barbier und Michel Carré, das Gounod für seine Oper Roméo et Juliette verwandt hatte—„Qui reste à sa place / Et ne danse pas / De quelque disgrâce / Fait l’aveu tout bas. Einige Kommentatoren haben nahegelegt, daß Debussy, indem er diese Zeilen zitierte, all jene ansprach, die wie er nicht in der Lage waren, im Krieg auf dem Schlachtfeld zu kämpfen. Das erklärt jedoch nicht die Widmung „à mon ami A. Kussewitsky“. 1913 hatte Sergej Alexandrowitsch Koussevitzky Debussy aufgefordert, mehrere seiner Werke, darunter die Nocturnes und Prélude à l’après-midi d’un faune in Moskau und St Petersburg zu dirigieren. Obwohl die Briefe an seine Familie erkennen lassen, daß er es nicht genoß, so fern der Heimat zu sein, und sich in Rußland sogar regelrecht unwohl fühlte, war Debussy sowohl von Koussevitskys unbezähmbarer Energie als auch von seinem Orchester beeindruckt. Das mit dem zweiten Stück verbundene Zitat ist der Ballade contre les ennemis de la France von Francois Villon entnommen—„Prince, porté soit des serfs Eolus / En la forest ou domme Glaucus, / Ou privé soit de paix et d’esperance / Car digne n’est de posseder vertus / Qui mal vouldroit au royaume de France“—Debussys Zorn auf die Feinde Frankreichs wurde insbesondere ausgelöst durch den Soldatentod eines Cousins von Jacques Durand, der ehedem für das familiäre Verlagsunternehmen gearbeitet hatte. Die Widmung „au Lieutenant Jacques Charlot tué à l’ennemi en 1915, le 3 mars“ nennt den genauen Zeitpunkt, an dem der junge Mann gefallen war, und läßt keinen Zweifel darüber aufkommen, wer seinen Tod verschuldet hat. Ravel sollte später eine ähnliche Geste zum Andenken an Charlot machen, indem er ihm das „Prélude“ aus Le Tombeau de Couperin widmete. Die Zeile, die Debussy im Titel des letzten der drei Stücke zitierte—„Yver, vous n’este qu’un vilain“—entstammt einem Gedicht, das er bereits als drittes der Trois Chansons de Charles d’Orleans für unbegleiteten Chor vertont hatte. Der Briefwechsel im Oktober 1915 zwischen Debussy und Strawinski (dem das dritte Stück gewidmet ist), in dem es um Vereinbarungen für eine Aufführung der Nocturnes in Genf geht, offenbart außerdem, wie sehr der Krieg die Gedanken beider Komponisten beherrschte, sowie ihre Befürchtung, daß er nicht nur die Vernichtung ihrer Heimatländer, sondern auch ihrer Kunst bewirken werde.